Jedi News is reporting a rumor from an unnamed source that the long awaited Star Wars: The Clone Wars"Bonus Content" may be released via a Star Wars app on AppleTV. See their full story at: RUMOUR: Star Wars TV Shows To Get Digital Distribution. Our Facebook friends were outraged when we first reported this rumor on August 27th. The vast majority want a physical release of these episodes on DVD or Blu-Ray to add to their Star Wars: The Clone Wars collection. 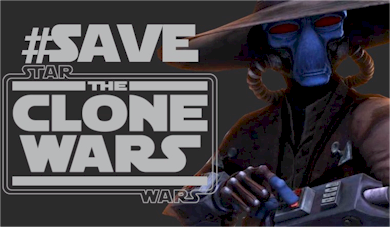 Join the discussion on our Save The Clone Wars facebook page. I have an AppleTV and other Apple products, but if this app is like the current Disney and Disney XD apps, I will not be able to enjoy the Star Wars content. Both of the current Disney apps require verification of cable service, but my cable provider is not one that is compatible with their requirements. If the Star Wars app is a free app and does not require connection to a cable provider, and if this is only exclusive for a certain time period, I think this will be an interesting way to release the material. As long as in the future, the "Bonus Content" becomes available via iTunes, Amazon Video, DVD and Blu-Ray.